With Android Smartphones coming out in large numbers and the data usage charges increasing day by day with newer technologies coming out like 3G, 4G etc. The increasing number of Apps which run in the background and use up data without your knowledge. 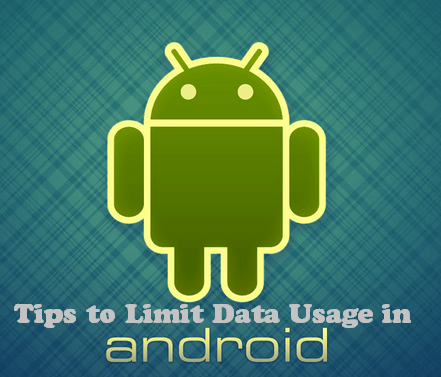 So here are some simple tips which will help you cut down on unnecessary Data usage and also some tips to make sure data usage is at its lowest. These tips are useful in Sony, Samsung, HTC, LG, Micromax, Motorola and many other companies which use Android as their OS. Auto Updates take up the major part of Mobile Data as you will be having many apps and each one is updated regularly by the developers, so if you forget to turn “Auto Update” option off on your device, data will be used without your knowledge in the background. So i suggest either keep the option of Updating Apps only in Wifi or turning Auto Updates off and updating manually when connected to Wifi through Google Play Store. With help of Browsers like Chrome and Opera which give you the options of Data compression which essentially means that photos will not be loaded in websites you open and websites will be loaded in Html format which decreases the data usage by almost 50% as most of the data is used up in loading of photos. This setting can be seen in Setting under Browser options and this might affect the clarity of your browser a bit but is worthwhile in conserving Data and limiting the usage limit. Google maps always has been a savior in helping us to navigate through cities and crowded streets, many other GPS navigation apps have come up which use up a lot of data as they are constantly updating. So you can use the ‘watch later’ option on YouTube. It allows you to download the content on WiFi to view at another time. In this way, you can preload videos and content and save data in the process. In case of Maps also we can preload and cache the route and use it without using data while on the road. This saves a lot of Data and also helps in increasing the Battery life. Social media apps and App updates have the option of Auto Sync which allows them to automatically use Mobile Data running in the background when ever there is an update for the app or there is a Social media update in your account. This take up lots of data as the apps are constantly connected to the internet and searching for updates. So by turning Auto Sync OFF you can decrease the Data usage to the maximum extent and the Apps will be updated or loaded only when you launch the App. Turning off Mobile data when you are not using the internet is a good way to limit Data usage by stopping use of background data when you are not following the above given tips. In case of traveling, while you are sleeping or are in a meeting you can turn the Mobile Data Off. There is an option in the Data settings page (Settings <- Data settings <- Set Data Limit) which lets you put a limit on Data usage. This will give you a warning when you cross a certain amount of data which you set as a limit. These are some pretty simple steps which can be used to control and limit your Data usage and cut down on the costs of the ever increasing price of Mobile Data by Network providers. I guess this would clearly help Android Smartphone and Tablet users on How to decrease Data usage in Android Phones and Tablets. Thank you, Doctor Varun. You pointed me in the right direction for my Motorola Droid. It has a “Data Saver” that I turned ON to keep the apps under control.